Despite three previous posts regarding compliant juries (here, here, and here) I have yet to establish that juries are compliant. I haven't even defined what I mean by a compliant jury. 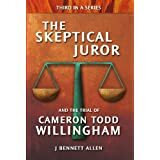 I realize that I claimed a compliant juror is the opposite of a skeptical juror, but that merely sidestepped the issue: I didn't define a skeptical juror. In this post, I hope to ameliorate those shortcomings. I'll begin by establishing that juries do tend to be compliant. Then, I'll actually define the term. 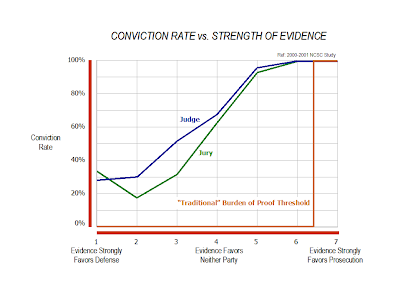 To establish that juries tend to be compliant, I'll borrow heavily from an earlier post in this august blog: Burden of Proof as a Legal Fiction. I hereby intend to prove to you, beyond a reasonable doubt, that the concept of "proof beyond a reasonable doubt" is nothing more than a legal fiction. This shouldn't take too long. Consider first the alleged burden of proof in a civil case. That burden is usually described as the "preponderance of the evidence." It's a 50-50 type decision. If the evidence favors the plaintiff even by a teensy weensy bit, the jury is to find in favor of the plaintiff. If, on the other hand, the evidence favors the defense even by a smidgeon, then the jury is to find in favor of the defense. It's so simple. I present the idealized concept of preponderance of the evidence in the figure below. Matters are a little more confusing for jurors in a criminal case. They are asked to decide if the evidence proves the State's case beyond a reasonable doubt. The jurors must figure out how heavily the evidence favors the prosecution AND they must figure out what the hell the term reasonable doubt means AND they must decide whether the weight of the evidence provided by the prosecution exceeds the reasonable doubt threshold. 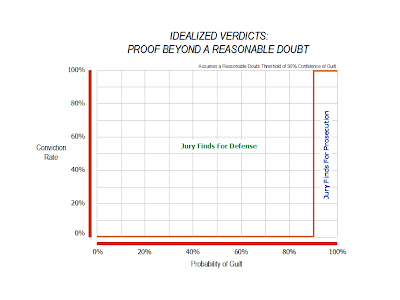 Courts are of almost no help in determining the meaning of reasonable doubt. One thing they absolutely will not do is apply any numeric value to reasonable doubt. They never suggest anything such as "you must be 90% certain." The question naturally is what is a reasonable doubt. The words almost define themselves. It is a doubt based upon reason and common sense. It is a doubt that a reasonable person has after carefully weighing all of the evidence. It is a doubt which would cause a reasonable person to hesitate to act in a matter of importance in his or her personal life. Proof beyond a reasonable doubt must be proof of such a convincing character that a reasonable person would not hesitate to rely and act upon it in the most important of his own affairs. Legal scholars recognized that if you are to quantify the number, it should certainly be greater than 50%. That is, after all, the standard for civil cases. The burden of proof in criminal cases is supposed to be substantially greater. Legal scholars tend to throw out a value of 90% as a starting point. This corresponds roughly to William Blackstone's 250 year old claim that it is "better that ten guilty persons escape than that one innocent suffer." That traditional view is portrayed in the figure below. When Rita Simon and Linda Mahon asked 106 judges to put a non-legally-binding number to proof beyond a reasonable doubt, those judges gave a number (presumably on average) of 89%. Simon and Mahon also asked 25 jurors to put a number to the concept. Those jurors put the number at 79%. That number is not far from a couple other studies I've seen where jurors put the number around 75%, assuming they are asked before they deliberate in a mock trial. If they are asked after they deliberate, the put the number closer to 55%. The suggestion is that they wanted to convict, the evidence didn't support conviction at even a 75% standard, so they reduced the standard. That smells of compliance. As part of a NCSC (National Center for State Courts) study in 2000 and 2001, judges and jurors were asked to provide their estimate of the strength of the evidence used to convict (or acquit) a defendant. I've converted the results into the summary plot below. Prepare to be disturbed. The results reek of compliance. Even when the evidence favors neither the prosecution nor the defense, both judge and jury are voting two out of three times to convict. Even when the evidence heavily favors the defense, the juries are voting to convict one out of three times. Now, finally, I'm prepared to provide a definition of a compliant juror. A compliant juror is one who relieves the State of its burden of proof, either willfully or carelessly. 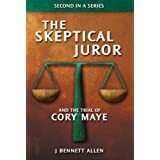 Since I've declared compliant jurors and skeptical jurors to be opposites, I'm ready to define a skeptical juror. 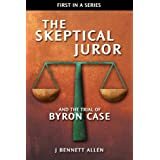 A skeptical juror is one who does not relieve the State of its burden of proof, either willfully or carelessly. With the amelioration out of the way, the series will continue. Next, I'll discuss alternative hypothesis regarding the compliant nature of jurors. Sorry to be hogging all the last couple of posts. Your comments are quite welcome here. I think even you are uncomfortable with your thought that juries simply vote without deliberation. You immediately follow that thought with an observation that we need to better understand jury deliberations. I suspect you would not argue for better understanding if you were confident that zero-deliberation verdicts was the way to go. I agree with your observation about better understanding jury behavior. Despite their frequent errors, I still strongly favor juries over bench verdicts. 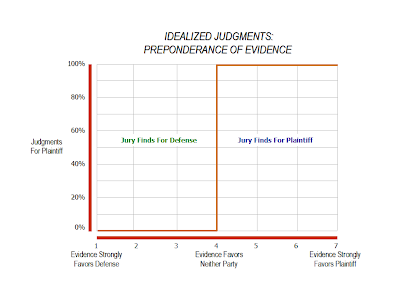 The evidence is, as shown previously in this blog, that juries are more accurate in their verdicts than are judges. I'm interested in improved accuracy of verdicts as well as fewer wrongful convictions. Please keep contributing. Because you challenged my jury-obedience hypothesis, I've put more thought into the matter. Though I still think obedience plays a major role in jury behavior, I'll be providing alternative hypothesis beginning today. I agree with you that many jurors are compliant but I also think there is a lot of skepticism. But a deeper understanding of how often the skepticism is voiced and how often it gets silenced from a controlling subset of the jury. When we are in a group, we do things we wouldn't normally do and some people, though skeptical, don't voice that opinion when confronted. You are ahead of me once again. I'll be getting to the skeptics in the jury room a few posts hence.